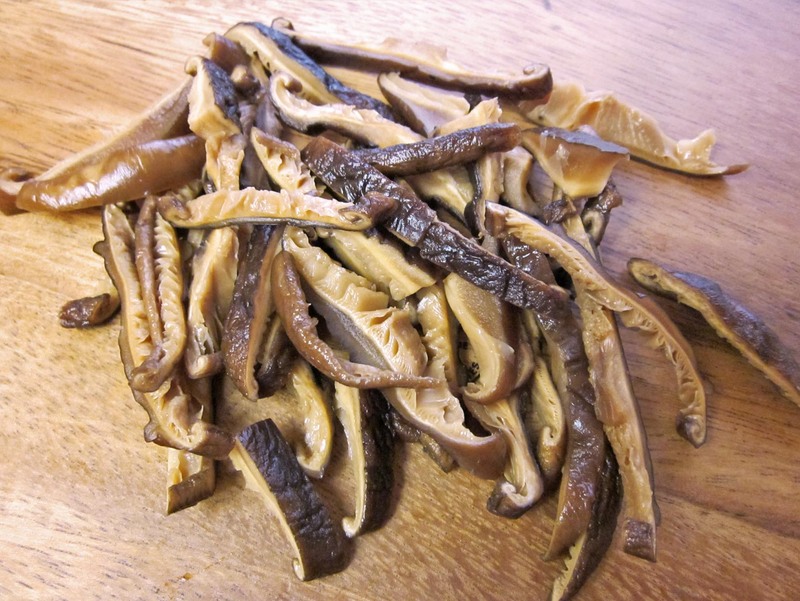 These marinated shiitake mushrooms are perfect for sushi rolls. Start with dry shiitake, rehydrate, and quickly marinate in sugar, soy sauce and mirin. Cover mushrooms with 2/3 cup boiling water and let soak for 20 minutes. Pour into a strainer and reserve the liquid for later. Rinse mushrooms and remove stems. Bring mushroom soaking water, sugar, soy sauce (or tamari) and mirin to a boil. Add the mushrooms to boiling broth and let simmer for 10 minutes. Drain and let them drip dry (or place on a towel to dry quicker). Cut mushrooms into strips. Use for sushi rolls.